There are 20 blog entries for July 2013. Wednesday, July 31st, 2013 at 2:43pm. Highrises.com DC team member Jake Abbott's listing at 631 D ST NW #1129 just went under contract in 6 days with multiple offers for more than list price. The Lafayette condo building at 631 D St NW DC in Penn Quarter is the sister building to the Clara Barton and share some of the amenities, like the roof deck, roof pool, exercise rooms and movie screening theatre. Unit #1129 was unique for having taller ceilings, hardwood floors, very large bathroom a gas stove and two balconies. Like other condo units in both the Clara Barton and The Lafayette, it included a washer and dryer in the unit. Wednesday, July 31st, 2013 at 1:44pm. 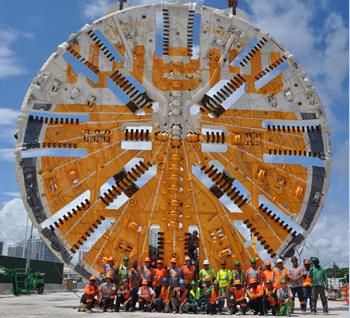 "Harriet" is the name given by The Miami-Dade Girl Scouts to the tunnel boring machine which is connecting Watson Island to Dodge Island. This massive project will take cargo trucks which service the Port of Miami off of downtown streets. Trucks will be able to access the port off I 95 to I 395 and go through the tunnel under the waterway. This will speed delivery of food and other products to the millions of passengers who set sail for a cruise out of the Port of Miami. This will help the many new residents of the downtown Biscayne Blvd who currently compete with the service trucks on the streets of downtown Miami. Are you looking for a Miami Condo? Search Now We have hundreds of listings sorted by advanced search features including by building. Wednesday, July 31st, 2013 at 11:19am. Will a new high-rise residency be coming to midtown Atlanta? Reported in curbed and biznow are rumors of Trivoli Properties, who bought the one acre lot off 13th Street near Jupiter for $6M, could now be moving forward with partnerships to bring a new apartment building to Atlanta. Rumored to be involved in the partnerships are Cushman & Wakefield who would be raising the equity for the project and yoo who has built luxury condos internationally. Tuesday, July 30th, 2013 at 11:57am. August is upon us which means temperatures soar. I will never cease to be amazed by those who complain about the heat...it's summer in Texas! What do they expect? Fortunately, in Austin we have Barton Springs, a three acre, spring fed pool within minutes of downtown. The 68 degree water offers relief from the heat and invigorates you as well. Speaking from experience, morning swims before 9:00 are ideal because not only will you beat the crowd, but your body will stay cool for a few hours! In the meantime, we've chosen some sizzling properties for your consideration. Thursday, July 25th, 2013 at 4:32pm. Thursday, July 25th, 2013 at 12:49pm. The Residences at City Center have been designed for those who love life. Located in Washington DC, the Residences at City Center is a brand new residential high rise condo building with 216 condos. These luxury condos, designed by Foster + Partner, have a light airy natural feel with plenty of natural light and are complemented by beautifully colored white oak hardwood floors. The materials used have high environmental standards to keep in alignment with sustainability practices. The Residences at City Center is expected to receive LEED gold certification. Wednesday, July 24th, 2013 at 12:36pm. In an article today by Finance and Commerce they revealed that Minneapolis Developer Paul Fry is considering developing the historic Fruen Mill into condos. Expected to start renovation this Fall, this building could become 114 condos and 50 micro units. The Fruen Mill was a cereal processing plant in the late 1800’s. The mill was abandoned and now is painted with graffiti and landscaped by overgrown plants. Follow us on Facebook, Twitter or G+ to stay up to date on the Fruen Mills condo development. Tuesday, July 23rd, 2013 at 11:21am. The new buzz talk is all about 3D cities. As land becomes less available, developers are building up to greater heights than ever before. But how does this impact the way people live in their daily lives? Where will they work at? How will they get the healthcare they need? Where will the schools be located? Where will they have room to be outdoors and enjoy recreational activities? Tuesday, July 23rd, 2013 at 10:29am. I love this concept. You will be able to play with all of the adult water toys as a resident of the building without the expense of owning, storing, and maintaining a personal paddle board, jet ski, or wave runner.This 51 story tower is now preselling. It's located on Biscayne Bay at 29th street, and will bring all of the fun activities that Biscayne Bay has to offer in house. Monday, July 22nd, 2013 at 2:07pm. The Austin real estate market continues to sizzle with a 20% rise in sales volume of condos and townhouses over sales through June 2012. According to MLS statistics, there were 20% more condos sold in Austin through June of this year than in 2012. There continues to be limited inventory, with a supply of only 2.9 months. Statistics for the month of June reflect the highest level of home sales in six years.